The broom news this week from the WCF has distracted me from focusing on the task at hand, rewatching and analyzing games from the National. The conversation has shifted away from "directional fabric" to water proofing and a "hardening" or "stiffening" insert. I leave the related adult jokes to your own imagination, but these new regulations appear to put one company in a tough spot. Hardline responded with their statement later in the day, disagreeing with the decision and stating they will "do what is necessary". Not certain this will come to legal action but given that the icePad was a previously approved broom and, two years later, is not, it's easy enough to feel empathy for their position. If you were a small business owner, how would you react in the same situation? Then again, it's possible all this news coverage might increase their sales. The Donald always said "all publicity is good publicity", or "there is no bad publicity" or something to that effect. Heck, they even made the New York Times. It appears the WCF (and possibly soon the CCA) feel the need to make a quick decision because, well, we are in the middle of November and a third the way into the season. Unfortunately, more time is needed and I hope this is not the final resolution. The WCF begins stating this ruling is in place until further notice but ends by commiting to continue to "work to establish a well-defined equipment policy". This last statement might lead someone to think their current policy is poorly-defined. Some think the ruling smells of corporate conspiracy. With Balance Plus being a sponsor of both the CCA and the WCF, it's reasonable that questions would be raised and fair to expect them to be answered. In any case, more to come I'm sure. Perhaps in 10 years an ESPN 30-for-30 documentary, released on Blu-Ray, digital download and 3D hologram, just before the 2026 Olympics. The Carruthers squad can look back at a few situations as missed opportunities to change the outcome of this game. In the second end, tied without hammer, Gushue was in trouble most of the end until Carruthers third Braeden Moskowy came deep on his second shot. Brad was able to draw in to possibly escape, but Reid then made a fantastic shot with his next, leaving 3 of his own tucked in behind a corner guard. Gushue was unable to tuck his last rock completely but a whisker rub on Reid's final shot gave Brad the steal, a 5 point swing. Rather than being up 4, Carruthers ended up one down. A very poor mistake as they had no need to be so close to the guard or their own rock in the house (the one they rubbed). Carruthers could have been an inch further out and still scored 3 points. The difference between 3 and 4 (We =87% to 94%) is not large enough to be too cute on the shot. 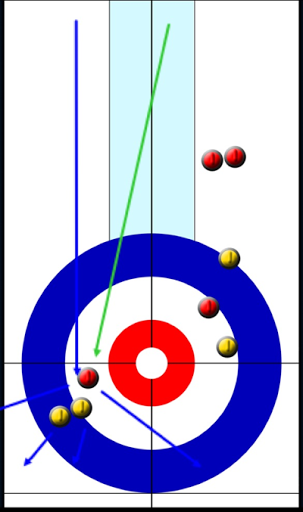 In the fourth end, some discussion from the broadcast crew on sweeping techniques, as they watch a single sweeper. A few good points raised that led me to think how much of the current controversy is over the technology and how much can be attributed to teams being innovative and doing things differently. In this game we saw teams corner sweeping hits with hair brooms in an effort to get them to curl. Kevin Martin bemoaned that he should have used one sweeper back in his day (which isn't really so long ago). Didn't mean to come back to this topic...damn you Mike Harris for bringing it up. Another missed opportunity in the 5th end. After a centre guard, Gushue calls for their first rock in the house and out to the wings. Martin suggests they would prefer a "soft deuce", ie. 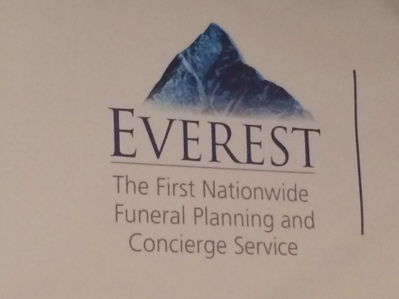 one without much risk, but their primary goal is a blank. A slight faux pas by KMart as they can't have 2 primary goals. Again, this is based on thinking that holding hammer in the 6th is the best situation, and as I've said at nauseum, this strategy is over thought. But not much harm, unless your opponent puts up a second centre guard and then play moves to the centre. Carruthers however, doesn't want to get that aggressive and choses to hit and sit for one. After a miss and a pick, Gushue gets into some trouble but Reid comes light on his first and then faces this with his final shot. It's unclear who is sitting shot, but by chosing to try the double (green line) Reid may believe it's Gushue. However, Harris, Martin and I all agree it's a strange call. Even with a made shot, Gushue is still likely to score his one. It could be a higher percentage shot for Reid to play a draw to the back four foot (blue line) and make Gushue's draw more difficult, also increasing the chance of a steal. In the end, Gushue drops an out turn draw to the back four foot to score two. The same draw that, if Reid had thrown, would have been a great result and perhaps changed the outcome of the game. Down two in the 6th end, Carruthers puts up two corner guards, one on either side. We've seen some teams choose to put two on the same side, one long and one short. Still not sure which strategy I prefer. Perhaps an error in 7th end or a change in strategy by Carruthers. As we return from commercial, lead Colin Hodgson is drawing around a lone centre guard. Perhaps his first was in the wrong spot (halfway between hog and top twelve) so they decided to come into the rings instead. In this situation, down one without hammer and 2 ends to go, two centre guards is a preferred position. However, a pick and a miss by Gushue third Mark Nichols puts Carruthers in a good position to force or even steal. Some discussion by Mike Harris about teams maybe preferring, under the 5 rock free guard zone, to be tied with hammer rather than two up without in the last end. Not enough data yet to prove out this theory but I would guess it is closer but still a small advantage to be up two. Under the four rock free guard zone, up two without hammer has a WE = 88%. Perhaps with the 5 rock rule we may see this drop a percentage point or two. Tied with hammer WE is historically 76% but per my article last season is closer to 80% and for some teams that are proficient with the tick shot, possibly higher. Gushue gets his single and holds on in the final end for the win. A great battle for the first ever Womens National Grand Slam. A couple of interesting situations. In the third end, Homan is 1 up and could draw to sit two and force Fleury to a single (green line) but instead chooses to hit (blue line) and allow a blank. Kevin Martin suggess Rachel is concerned about leaving a possible shot for two. The decision might indicate that Rachel doesn't expect her draw weight to be accurate enough. I expect many other skips would have drawn to sit two in this situation, but in Womens the WE is actually about the same (58% vs 59% for tied with hammer). So perhaps Rachel does trust her draw weight, and trusts CWM and curling analytics even more. In the 7th end another interesting situation. Homan lead Lisa Weagle attempted a tick on her first shot. She instead tapped the Fleury stone into the back four foot, leaving her rock as a centre guard. Tracy should have thrown a long guard in front of the Homan stone. Instead she chose to come into the rings. The probelm is, Free Guard Zone only stops a team from removing their opponent's guards. Homan was able to play a runback on Lisa's next shot. Of course, that runback left another centre guard and ultimately Homan got into a mess, eventually surrendering a steal of one point. Or was it? Back to the title of this article. The Fleury team acted like pros in a difficult situation. After the final rock of the 7th end, Homan second Joanne Courtney cleared a Fleury stone that could have been measured. The TV monitor appeared to show it was likely not second shot, but we've seen those overhead cameras lie to us before. Heather Nedohin was certain she had lost to Jennifer Jones in the 2012 Scotties Semi-Finals, but ended up winning the measurement and went on to win the national championship. Team Homan also acted like pros in the situation. Rather than pouting about their mistake or brushing it off as no big deal (as I recall seeing a famous third in mens do in a similar situation many, many years ago), they properly gave the option to Tracy of deciding what her team wanted to do. It is ultimately the non-offending team's choice to decide the course of action. Tracy chose to take a single point and went on to lose when Homan scored a deuce in the final end. Not an easy situation that tradition and curling etiquette creates and many teams don't always take an empathetic position. I recall one instance from my early days in mens where a well known and well liked team from Manitoba made a tough choice against us in an important game. On our skips first shot we tapped a stationary guard with our broom while attempting a hit. Rather than put the rocks where they would have gone (we either would have made the shot or hit the guard and they would would split apart), our non-offending opponent chose to remove our stone from play and keep the guard in its place, actually tapping it back into its original position. Thankfully for us, our skip then made a runback for two points on his next shot and we went on to win the game and knock our opponent out of contention for the provincials. Homan wins again. Her numbers this year are nearing Steph Curry and Golden State levels. I will enjoy watching them both for the remainder of the season. The National has already started but let's take a quick look at a couple of scenarios from the Masters. The first situation involves the 7th end of the Men's semi-final between Kevin Koe and Mike McEwen. This would have been a great game to watch but television viewers were instead served a potpourri of shots from all four games taking place. I understand the desire to capture the best shots across all games and the SportsNet crew has improved with this broadcasting approach, but I would prefer to watch a single strong game and see how ends develop rather than jump around. McEwen scored a critical three in the sixth end and we never saw how it happened. Curling's version of the NFL Red Zone isn't something I'm interested in watching but I wonder if other viewers would disagree. BJ now noses with his runback of the corner guard and when the dust settles Koe is sitting first and second behind cover and fifth stone biting. With a Kennedy hit on the back stone Koe then sits 1,2,3 and 5. Ultimately, Mike makes two spectacular shots, a triple followed by a runback double and Koe has no choice but to blank the end. The McEwen squad could simply look back at this end and thank their skipper for saving their bacon, or they could examine whether they put themselves in the best position possible. Corner guard, Mike now can chose to peel or try the same corner freeze with BJs second shot. If he comes light (as he did), we're into the same mess. If he makes the shot, Koe now has one less rock to try and score 3 or more points. If Kevin freezes to his own rock, Mike can blast the staggered rocks, but will have some risk of jamming the red stone onto his shot stone top 4. 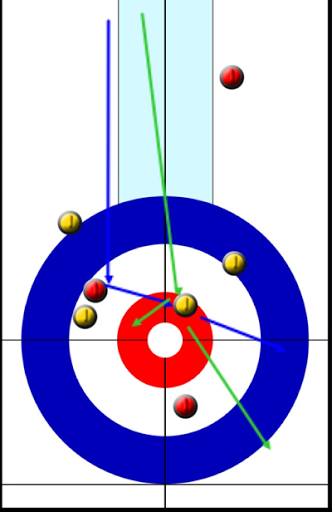 Koe would then sit 1,2 and 3 and will likely score three unless Mike is able to make a triple or runback double, depending on where Koe places his first shot. Assuming both rocks are buried, a better choice in this case would be for Mike to hit and roll off his shot stone and remove one or both of the buried red stones. In the case that Kevin is not fully buried, Mike may be able to blast one or more of the reds out of play. 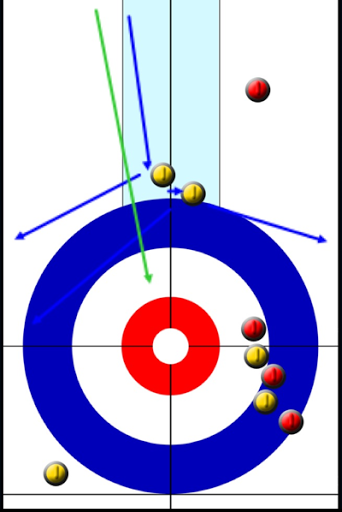 With a hit and roll Koe will have his two rocks close together, Mike can now blast the staggered rocks on his first shot and Kevin will have the option to guard his two stones or draw to the open side to sit 3. If he sits three, Mike should have a high probability of a double (and possibly triple) and Koe will likely end up with his deuce. A guard will leave a runback for Mike to try and kill at least one Koe stone and again, Koe will get a deuce. I'm not certain trying to corner freeze on BJs first shot is the best decision. I'd prefer to open things up at this stage, and not play further into a draw-behind-corner strategy. However, you can see that all scenarios will result in Mike needing to make a big shot to get out of the end. Interesting how this all resulted from a corner freeze from Brent that left McEwen sitting 3. Reminds me that staggered rocks are a real pain in the derriere and teams should try to create this type of situation when they are behind in order to stymie their opponent. Women's Finals, 6th end, Homan is up 3-2 with hammer. On second Joanne Courtney's last stone they attempt a difficult soft weight hit (green line) rather than peeling a long guard (blue line). 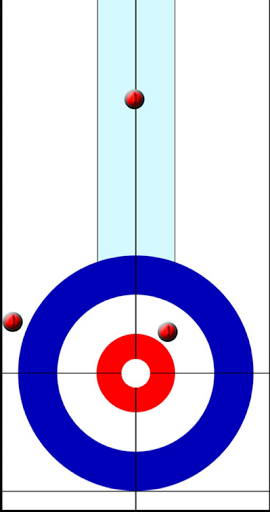 Perhaps they misjudged the amount of curl, but the shot is swept to get past the guard but does not curl at the end leaving two red stones in the four foot. A poor first shot by Sweeting third Lori Olson-Johns and subsequent hit and roll by Emma Miskew helps Homan escape the early danger. Sweeting then has Lori attempt a long runback (green line) that overcurls for a straight peel and Homan sits 2 with 5 rocks to go in the end. I'm not thrilled by this call and clearly the nose hit is critical to leave a centre guard that could help them escape the end or even sneak out a steal. They could have instead tried a soft weight hit with the inturn, the exact same shot that Val makes on her first shot two rocks later! Rachel and her team have some deliberation, before deciding to throw a guard. Commentator Mike Harris asks Kevin and Joan their preferred options. Both are wary of the guard. I agree. Rachel has a one up lead with hammer and clogging up the centre here could leave her without a path for a final draw if the end starts to go badly. Granted, it looks great for her right now, but she is essentially assuming her tight centre guard can be promoted later if she gets into trouble. She is placing stones that give her a chance at a big end but also leave her opponent a possible escape hatch. The problem is, Homan doesn't need to score more than two points. With a deuce her Win Expectancy (WE) = 94%. In fact, scoring 1 is still a great position (WE= 83%) and her only real mistake would be to allow Val to steal (WE=62%). In the end, Rachel makes an angle raise for two and goes on to win the game. Proving once again that questionable strategy only becomes apparent when it leads to a bad result. Firstly, I want to point out that technology is a wonderful thing. I was schooled as an engineer and have a generally optimistic view that we can avoid a bleak dystopian future (at least until our Sun reaches super nova) by aligning our great scientific minds to create advancements for the betterment of humankind. Just think about what we've already accomplished. The wheel. The printing press. The Internet (brought to you by Al Gore). Figuring out how to deep fry a snickers bar. Inventing a sensor for a new wi-fi enabled fridge that will update your mobile phone to tell you when your meatloaf has gone bad. Yes, the future does look bright, and not just because carbon emissions are heating the planet. This does not mean I'm naive to the possibility we will soon live in a world resembling Bladerunner and have oceanfront property in Arizona. I'm just hopeful we can avoid that outcome with the use of technology. When it comes to feelings about high tech advancement in Sports, the glass appears more half-empty to me. When I was younger, my favorite players and athletes were "throwbacks" who "play the game the right way". Some of this nostalgia is misleading when you realize that many legendary players were racist, violent and possibly criminal. Yes, I'm talking about Ty Cobb, but there were many others. In any case, I prefered a player like Will Clark, first basemen for the San Francisco Giants over a Deion Sanders of the Cowboys/Braves. Will's Wikipedia page previously (now removed) suggested he could have been a better player if he had exercised on occasion and been in better shape. What's more throwback than that? How could anyone born before 1975 not get choked up seeing classic photos of Guy Lafleur lighting up a cigarette between periods? To me there is more appeal when sports heroes are regular guys and not perfectly shaped athletes who appear to have been built in a lab. So where am I going with all of this? Brooms of course. Where else did you think we were headed? The advancement of golf technology has improved my game (or at least kept it from getting much worse), but in the days of balata balls and persimmon woods, it was much easier to determine who was a true shotmaker. Today, everyone on the PGA tour can hit it long and straight. Back then, straight was a skill and length was a marvel. Tennis seemed more creative when there were wooden rackets, flowing locks and multi-coloured wristbands. The power game of 300 mph serves from NASA composite rackets takes a little something away. 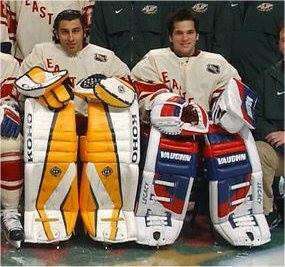 Featherweight goalie pads the size of giant shmoos lowered scoring, but thankfully were reduced in 2008 and again in 2013. This is a rare example of a sport scaling back advances to improve the game. When the protection or well being of the athlete is considered, technology should be encouraged. Few will argue helmets in football and hockey, or lab designed sneakers that reduce injury in basketball aren't for the better. But golf and curling (Brad Gushue's recent fall not withstanding) generally have less need for advancement in the safety of its competitors. But what about when technology changes the game? The skills required to excel at golf and tennis have changed based on technology, but people still watch and play the games. In the latter case with more pleasure from those same advancements that have altered the play at the highest levels. There is no doubt broom technology can help the club curler. The fewer heart attacks at the local rink, the better. But what does it do to curling? 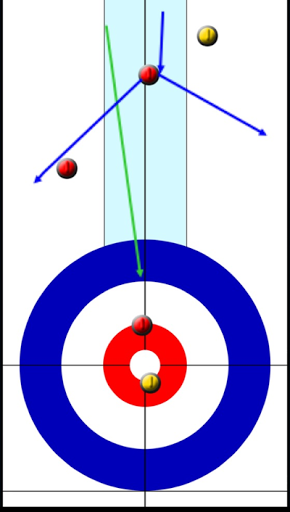 Over its history, curling has seen many technological improvements. 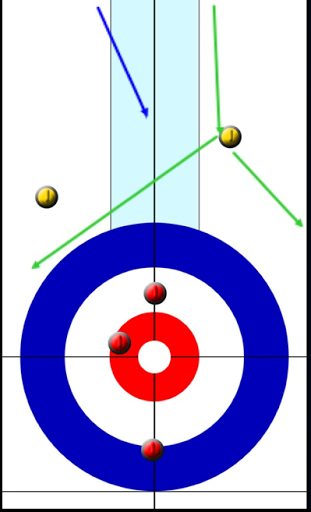 Most noteably, the move to push brooms from corn and improved ice conditions made the game more precise, but resulted in the need for rule changes to make the game more entertaining. There was a transition that many of us endured during the mid 80s to the early 90s, but thankfully the free guard zone saved the sport from a slew of 2-1 games and possible extinction. Interstingly, the free guard zone was largely driven and supported by the players. Sure, those pesky "old school" Canadians held out for a few years at a conservative 3 rock FGZ while the world moved immediately to 4 rocks, but eventually everyone agreed more offense made more sense, and maybe we'll see the 5 rock FGZ become standard in the future. The broomgate situation that has exploded in the early stages of this season, also appears to have begun with the players. The governing bodies appear to be behind in taking the necessary steps to properly police those pesky sport scientists who are working on the roaring game. Now they are playing catch-up, and maybe moving a little too quickly. The World Curling Federation released a statement on October 30th that stated "This is a very complex subject...taking the time necessary...we believe it is better to do this "right" than to do it fast". Then they made a ruling in less than week. Not sure how your government operates, but 1 week for this type of organization seems to be relative to the speed of the Berne particle accelerator. Granted, they have stated it is an interm decision and applicable for the Pacific-Asia Championships, being held this week, with further rulings to come. At stake in the short term is the possible fate of one company (Hardline and its IcePad) and the reputation of another (Balance Plus). Putting claims of corporate underhandedness aside, the key question ultimately raised by this situation is "what impact should sweeping have on the game?" 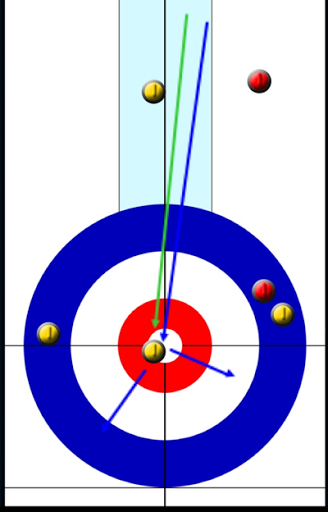 The rules of curling state something to the effect that equipment should not alter the playing conditions. Strange, because ice has been "fudging" from use of synthetic push brooms since their inception. Before that, the use of corn brooms and their "chaff" dramatically alterted the path of rocks on the ice. The very nature of sweeping is to help alter the conditions of the path of the rock. The intent is that following a shot, the conditions should then revert back to their original state for the opposing team. We know that this is never completely possible, (pebble is being broken down with each swept rock) but at least if the conditions alter in a consistent manner that each team can analyse and adjust to, it could be deemed more competitively fair. I'm not as concerned with Nolan Thiessen or Ben Hebert's arguement related to physical conditioning and the elimination of "athleticism". The days of corn brooms for 12 ends, three draws a day are long gone and every advancement since has made it easier to sweep well. I'm not so sure the fans care as much as some players might and don't feel that's the primary arguement for scaling back the technology. Even the ability for brushers to make the rock do strange new things (like fall rather than curl) could be argued. Granted, if it reached the point where guards no longer "guard" anything then we're back to 1990 again and no one wants to see that. But if one broom can do "new" things, maybe we should be open to allowing some of this in the game and letting all teams take advantage? I'm not agreeing with this statement, I prefer that sweeping only make a rock straighter and go further, but that doesn't have to be the case. 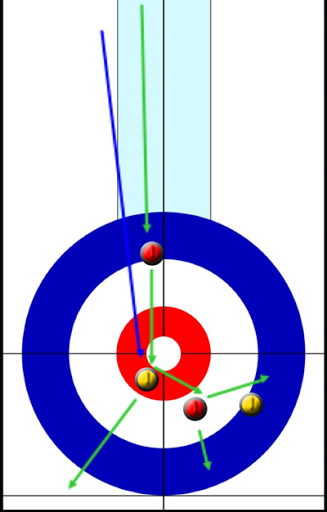 Fundamentally Curling must deal with answering two questions: what is acceptable for the impact on the speed and direction of a stone from sweeping and to what level should conditions of the surface be altered. I'm not going to answer these two questions, it's not a simple task. But in a sport that is over 400 years old, is this something that should be handled in the matter of a few weeks? Probably not. I feel for the folks at Hardline and suggest you listen to Dean Gemmell's latest episode of The Curling Show with Archie Manavian, President of Hardline to get his perspective. 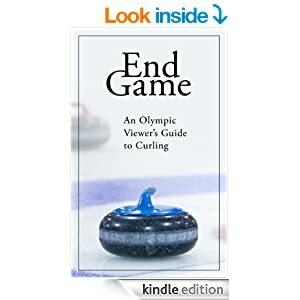 You can also check out his previous show with Ben Hebert and Mark Kennedy on the same topic, or read up on the many forum posts on CurlingZone. Also see CurlingZone's Gerry Geurts recent post here. A must read. The fact this topic is putting players and their sponsors at odds is unfortunate, and seems to be encouraging a quick resolution, but let's hope the players, manufacturers and governing bodies deal with this properly to lay out a foundation for the future that can satisfy everyone. (Um, not much precedent for this but we can always dream). The good news is the broom issue could be dealt with well before the Olympics and curling getting major news coverage (not just the CBC but home of Woodward and Bernstein, the Washington Post) is always a good thing. 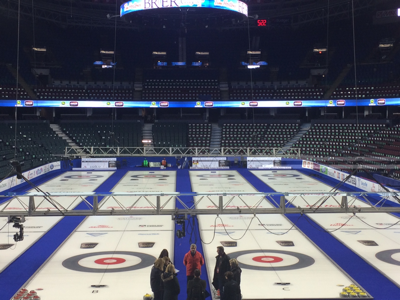 Finally wrapping up this article as I sit in a quiet Calgary arena, awaiting the historic Brier Pre-qualifier between Yukon and PEI. One day I can bounce my grandchild on my knee and say I was here. At which point he/she will likely poop in their diapers. The Saddledome is mostly empty, save for a pre-qual pre-preparation, held by CCA Csar Director, Warren Hansen. 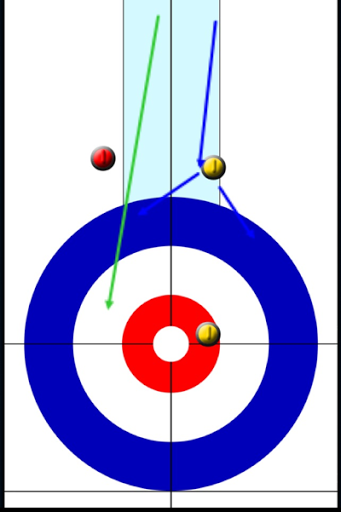 Stefanie Lawton reached this same position in her three previous Scotties as a skip, and finally pulled out a victory. She took a conservative approach to the week and it enabled her to win one more game than her usual result. Totals for her round robin games fell below 12.5 points for almost the entire week, leading websites to drop her games to 11.5 points, a number usually seen in men's events. I'm not going to challenge her strategy, or question her continuing to curl with a possibly passed her prime third, rather than inject some youth like others chasing the Olympic gold have. She remains a good under the radar gamble, and for that I will keep quiet. One interesting comment during the 9th end. Lawton is tied 5-5 with hammer. Broadcaster Russ Howard mentions Stefanie doesn't want to give up a steal in this situation. Possibly a slip from the veteran skip. The end had already developed to the stage that a blank was unlikely. At this stage, the team with hammer should be agressively attempting a deuce (Win Expectancy of 86%), even at the risk of a steal. Lawton will almost always have some shot to score one with her final stone and even if Homan steals, she has hammer in the final end with a chance to score two for the win. 8th end, AB up 6-5 with hammer. On Lawton second Stephanie Schmidt's last shot they choose to hit an AB rock in the twleve foot to sit 2, open at the back of the rings, rather than put up another centre guard. This is an incredibly conservative call that I haven't seen since the days of Connie Laliberte peeling guards when behind. The problem is, a successful hit will leave a simple double, and she's likely to head into the next end with the same score. Mind boggling. You don't have to be a master at analytics (like Charles) in order to know this is a bad decision. Strangely, Sweeting forgoes the double attempt and instead tries a freeze. She's not risking much, there are no guards and little apparent trouble at this stage. In the 9th end, this would be a wrong decision. Here it surpises me but likely not a significant mistake. 10th end: SK down 7-5 with hammer. On Lawton's first she chooses to draw around the red corner to sit two buried. Some posters on CurlingZone suggested a split. Difficult not to leave a double, perhaps even a triple, but good chance of 2. Val chooses to play a corner freeze rather a runback, and nearly gets shot stone. Stef still has draw for 2. She's unable to get a good path and comes up light. I don't mind the come around. I expected Val to play the 6 foot runback on her guard, perhaps so did Stefanie. The draw was very risky and could have left Stef a chance for the win. The decision Lawton has to make is whether you want to entice a draw from Val and increase the chance to win the game here or split and more likely score two. You can make an argument for both. A great shot by Sweeting that brought greater risk with less room for error, but she was confident in her weight and made the shot. I expect many mens teams would have played a runback in that situation. 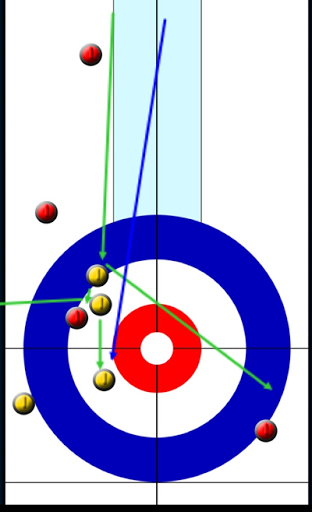 Val Sweeting incorporated a Lawton strategy in her game with Jennifer Jones. Conservative. In the 3rd end, tied 2-2, MB with hammer, AB sits 1 on the top four foot and Val decides to peel the corner guard on second stones. She mentions she's guessing on ice. At this early stage of the end, less critical to put up a perfect centre guard than to, at the very least, have one. Jennifer then replaces the corner guard. In the 5th end, AB is down 3-2 with hammer. Val immediately calls for a freeze/tap with her first shot (green line). Sitting second shot and facing a longish guard, not sure why she didn't look at trying to remove the MB stone (blue line). She would roll open and Jennifer would hit, leaving her a final shot for 2 points. She needs to move the MB stone to get shot, might as well move it to the back twelve. Appeared there was enough curl. The end result, Val's draw over curls and sits second shot. Jennifer draws on top and Val attempts a flat double off the MB stone at 9 o'clock, moves the shot stone far enough for one, almost scoring two. In the 6th end AB is tied 3-3 without hammer and again thinking of peeling corner guards (green line). Third's first and sitting three. They correctly decide to play a guard (blue line) instead. Why peel a guard that is not likely to come into play this late in an end and which also may be cutting of a potential draw to the button later on? 7th end: 4-3 for MB, AB with hammer. This end may have decided the winner. AB third Lori Olson-Johns is an inch short on her draw earlier in the end, now sitting second at 2 o'clock. Val plays a freeze to the open side and Jennifer decides to freeze again (green line), rather than peel the rock out (blue line). Even if Jen looses her other rocks, Alberta is left with a draw for 1. As it turned out, Jen's didn't curl enough and Val had a makeable shot for 2, but she missed it again by a fraction of an inch. AB takes one. 9th end. AB down 5-4 with hammer. Val seemed to be playing runbacks (green line) with the intention of blanking, but it was unlikely that late in the end. Rather than running back the MB stone on Lori's first shot, to try and sit two, (which was more difficult than it appeared) perhaps they could have tried a soft weight tap and would have sit frozen on two stones (blue line). Well done Jennifer. Team Canada again and Sweeting a bridesmaid for the second straight year. Kevin and Gerry are joined by 2012 Scotties Champion Heather Nedohin to discuss pre-qualifiers, Nunavut's no show, and the soul of curling. Heather shares her new experience running a curling club and playing pickleball. An epic battle was waged on Monday Night Scotties that could be a deciding factor in who gets to the 1vs2 game and who has last rock. Ok, not earth shattering consequences, but it did matter for something. Jones won in an extra end and quickly comments were populating on CurlingZone that Homan coach Richard Hart made mistakes, that Hart imposed his opinion, that Hart allowed Rachel to decide, Canada didn't deserve to lose, Manitoba played better, Jones was lucky to hang on, etcetera. On her final stone, Rachel calls a time out as they discuss whether to attempt a double for 3 (blue line) or soft hit for two (green line). If she attempts the double, and we estiimate she scores two 20% or one 20% of the time, Rachel needs to score 3 greater than 30% of the time for it to be the correct decision. Plenty of what-ifs and different guesses will produce a different analysis, but in the end I think it was the correct call. In this case, the reward didn't appear to out-weight the risk associated. This is a situation where, given a close decision, teams will often choose the option with a lower variance. Given the equal capability of these teams, it makes sense. In the same situation, a weaker team may benefit by choosing the riskier shot. 9th End: Jones is tied with hammer. Strangely, on Dawn's second shot, Jennifer asks her to freeze, leaving 3 rocks in the four foot, when she could have instead played a hit and roll to sit two. Not sure what Jones was thinking. Seemed like a strange call when you benefit from keeping a potential blank in play in this situation and you don't want to create a pack of rocks in the middle of the sheet to get 2 points. Oh, and then Manitoba plays a freeze on Jill's first rock. Five rocks in the four foot now. Not for long. After Joanne's shot, there is now six. On her last shot, Jennifer tries a double to take 2 points (maybe she saw a 3?) when all she needed was a draw to the full eight foot. Supposing both shots were equal odds of being made, I can't argue with her assessment of her chances with the hit, but if they knew they were shot, drawing the full eight foot seems the preferred option. There didn't appear to be any chance at 3 and at this late stage of the game, there's zero reason to take any additional risk for a trey over a deuce. 10th End: Homan 1 down with hammer. On Team Canada third Emma Miskew's last rock, Homan calls a time out to discuss whether to double peel the front stones (blue line) or to draw around centre (green line). Coach Richard Hart sounds more committed to the draw and appears to be less interested in the peel, something many internet posters claimed "lost Rachel the game". Firstly, there are still 4 rocks to come and this one decision, though it appears critical, will not decide the fate of Team Canada. At first, the double peel seems like a good decision, it allows play away from centre, increasing the chance of scoring at least one. But keep in mind that teams don't try to score one in this sitiuation, they will increase risk in order to score two points, rather than face a likely defeat in an extra end. This risk is often seen on the last shot but also occurs earlier in an end. If Miskew peels, and Jennifer makes the corner freeze, Rachel will need to hit and hope the angles are in her favour creating an advantage when the dust settles. It's anyone's guess on what the end result will look like, but I can see several situations, both good and bad for Rachel, depending on where Jennifer's rock settles and if she taps anything back, changing the set-up. It's also important to note than Emma was heavy with her draw and the great raise double made by Jennifer would not have been as accessible if she was top eight rather than top four foot. At this stage, Rachel still has two rocks to get her deuce and several guards and rocks in play. Russ Howard's comment "rule number one, control the front", seems so obvious in hindsight, after the shots are complete, but I don't agree. In this position 1 down with hammer in the final end, scoring two is the priority and teams should adapt to the situation to give themselves the best opportunity. I'm not completely agreeing with the decision, but I am certain it was not as clear as Russ or some internet skips would suggest. Extra End: Jones tied with hammer. Homan has a rock half in the top four foot but Jones sits second off to the side. Coach Hart clearly leaves the decision to Rachel to decide what shot they want to leave Jennifer on her last, draw to full four foot or a double. Even with a tap, Jennifer still had an open path to the button and may have chosen to draw, depending on the position of the rocks. Rachel may have been able to tap her rock into a position where a double might jam on the Jones stone, but very difficult to tap to the perfect spot and even so, to create that possibility, Jen's final shot likely noses for the winning point anyway. A case can be made for both options. In the end, Jennifer draws for the win. (At least I think she did, my PVR ran out at a whopping 3 hours 31 minutes. Another vote for 8 end games).